MARTIN O’NEILL SAYS he plans to talk to James McClean ahead of what is likely to be an emotional occasion when the Republic face Northern Ireland on Thursday, while Stoke boss Gary Rowett has defended the player while suggesting his performances have not been good enough at times this season. The winger has been the subject of controversy in recent weeks. As has continually been the case in recent years, the Irish international has had to defend his decision not to wear a poppy to mark Remembrance Day — an event in Britain and other members of the Commonwealth honouring the memory of armed forces who have died in the line of duty. 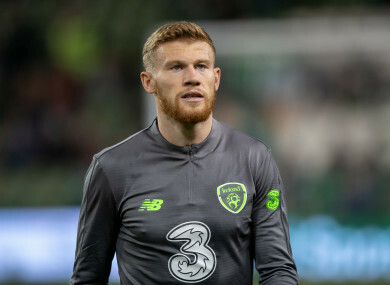 The argument escalated after McClean was booed by a section of his own support, with the player subsequently branding those who objected to his stance “uneducated cavemen”. The star received a warning from the Football Association for his use of language during an Instagram post, while a number a number of groups have called for the player to be given more support for what they consider to be anti-Irish racism aimed at him. The 29-year-old, however, subsequently apologised in a statement to the “vast majority of Stoke City fans who although they may have different views to myself are decent and respectful”. However, the winger was still booed throughout Stoke’s match with Nottingham Forest, in which he started, at the weekend. Afterwards, manager Gary Rowett was asked if the club’s disillusioned supporters would ever forgive McClean. “I hope so,” he told reporters. “But I can’t really make that comment. I don’t know, I hope they do. I can understand why people wouldn’t like some of the things he’s said, but I also hope that everybody believes everyone has a right to follow their own pathway. “What I would say is that in both games, the [Remembrance] tributes have been brilliant and it’s a shame we end up talking so much about one person’s beliefs. “He showed courage in difficult circumstances and our fans got behind the team brilliantly, as they always do away from home. “The one thing you cannot criticise him for is standing up for his beliefs, which takes a little bit of bravery, and I thought he performed with bravery. “In a difficult situation he’s come out and performed really, really well. I would say he can perform better than he has done and sometimes that’s been the issue. If James had been in top form then maybe things wouldn’t quite go the way they have. The reality is he needs to perform better, but it’s difficult. “He missed seven weeks of pre-season and was training on his own. He had to virtually come straight into football and run out of a little bit of steam. Amid all these issues, McClean is preparing for a match against the North — the side he represented at underage level before switching allegiance to the Republic. Asked whether controversy surrounding poppies and the various other issues would be a factor during the game, O’Neill replied: “I really don’t know. James had an illness in the family yesterday, so I wasn’t able to get a chance to speak to him. He has just come in this morning, although he trained this morning, and I will speak to him over the next 24 hours. The Ireland boss added that he was unlikely to have a similar talk with many other members of the squad. Meanwhile, Irish captain Seamus Coleman backed McClean and said his decision not to wear a poppy should be respected. “Look, James is well fit to handle himself, as people know,” the Everton star said. “James made his points clear on the poppy situation three or four years ago when he was at Wigan. “He gave a statement and he tried to be as respectful as he could in that statement, and I think he needs to be respected for his decision. Email “'If James had been in top form then maybe things wouldn’t quite go the way they have'”. Feedback on “'If James had been in top form then maybe things wouldn’t quite go the way they have'”.